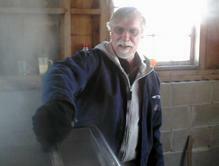 Being cold outside, Craig stirs boiling sap to stay warm. Made a career of talking during other people's sleep as Congregational minister. Having steamed wallpaper off the kitchen walls making syrup at home, Charlie's wife Lydia encouraged him to find another venue. In addition to making Hillcroft Farm run, Charlie now boils down 40 gallons of sap to make one gallon of syrup in a house with a large hole in the roof.